It's true. 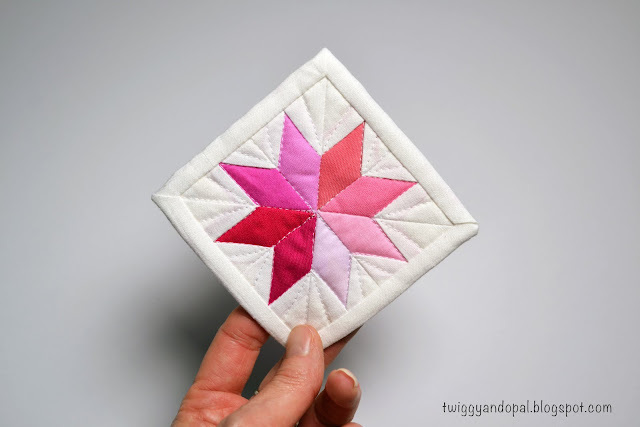 I've been bitten by the Mini Mini Quilt bug again! There are times when we want a little project to whip up, something quick that will soothe and pacify that urge. My remedy for that this time was a couple Mini Mini's. There's a satisfaction when completing a little quilt like these, and I'm not sure why that it! It may be the nearly instant satisfaction of a finish, the joy of having made something so small...or perhaps the fact that my itch was scratched! I've made this star many times, usually in a beautiful rainbow spectrum. To change it up I went with shades of pink. Pink are the colors I used in my Round Robin center block, one of my Electric Hearts...so it seems I'm in a color phase at the moment! Pink are the colors I used in my Round Robin center block, one of my Electric Hearts...so it seems I'm in a color phase at the moment! With Mini Mini's, I don't have to stress or fight with the quilting. To me that's a win win! 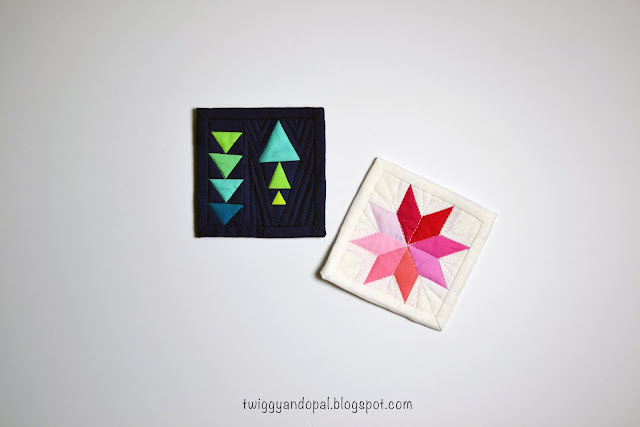 Both of these blocks were paper pieced. It allows me to go super tiny especially when I want precision. Plus, I really love paper piecing and find that I'm doing it more and more lately. 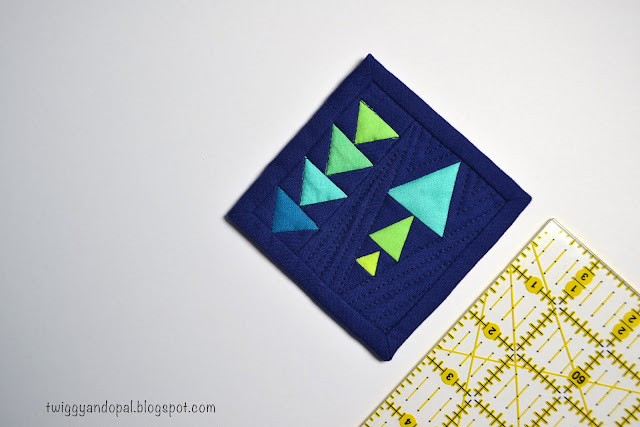 Mini Mini's are also a great way to use small scraps. If I have a pile of scraps from a quilt it's hard to let them go! A quilt I have yet to share used these fabrics, and I had a nice pile I couldn't and wouldn't let go of. I have several other projects in the work using those scraps and the fun won't end until I can use every last piece! I hope you like this color combination because you will be seeing it a lot...a lot! Have you tried your hand at a Mini Mini quilt yet? 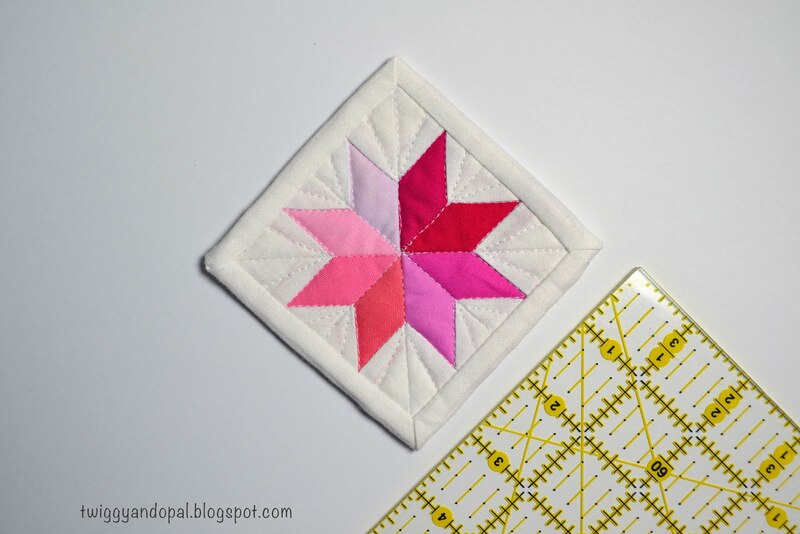 You might consider using left over or orphan blocks, or randomly sew together scraps. Even reduce your favorite block design...see how small you can go! I have your orange heart mini with me here at retreat. It looks great under the cute mug a friend brought me. I love that you took it to your retreat Libby! And love that you use it…how cool is that?! I haven’t made a mini mini in a long time and just felt the urge! I like having a quick little finish every once in a while! The pink one is nice but the navy one is lovely, great colours. Both of these color schemes have been consuming me the past few weeks. It might be time to move on to something else! At least it isn’t rainbows…again! They are just too stinkin' cute!! I am obsessed with these colors too! I pieced a top recently with those and white(haven't blogged it yet). I'm not a min fan and likewise with a mini mini. They look like pot holders to me. While yours are beautiful I would rather spend my time on something larger. I do understand the reasons that minis are popular, but they aren't for me. AND don't even get me going on mug rugs! Love those blues (and those pinks aren't too bad either ;) Do you wear magnifying glasses when you're making these??!! No magnifying glass! I enjoy the challenge and while I’m not as obsessed with them like when I first started, I still love seeing just how small I can go! They are fun and if you like a challenge…these mini mini’s would be it! If you have a pattern you like, you could always reduce it before printing it. Or like you said…design one! I hope you give it a try Jen! 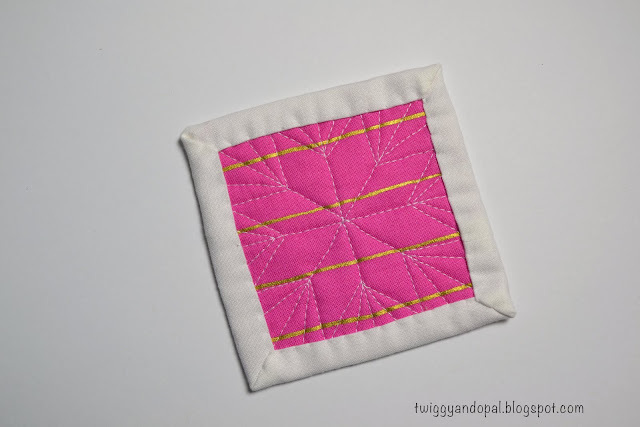 I have been making small mini quilts and turning them into pincushions lately. They are so fun! I always forget about making them into pin cushions! Thanks for the reminder! Your mini mini's are so cute. I really should use up some of my smaller scraps to make some for myself and some to give away as well. Your minis are so adorable, Jayne! 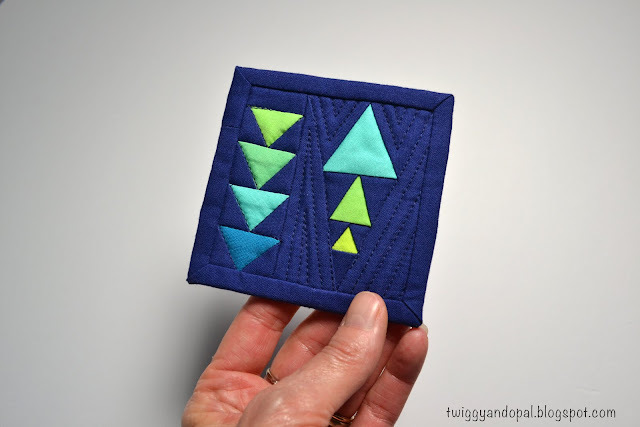 I love them both, but the dark blue with triangles is really calling to me! You and those tiny mini minis again. Wow.... Love the triangles.